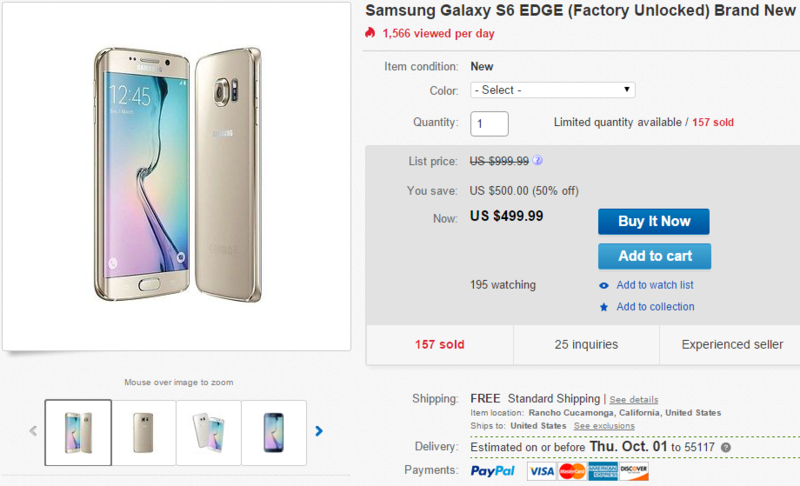 We've seen a number of good deals on the standard Galaxy S6 since it was released earlier this year, but the Edge variant pops up less frequently. It's a little more expensive to start with, but today you can get a 32GB GS6 Edge for just $499.99. It's around $600 elsewhere. The G925i is an unlocked version of the phone for the North and South American region. It has LTE bands 1, 2, 3, 4, 5, 7, 8, 12, 17, 18, 19, 26, and 28. That covers all of AT&T and T-Mobile's LTE bands, and it's even got AWS 3G for T-Mobile. This phone is SIM unlocked, but it is region locked to the Americas (thanks, Samsung). That means if you're going to use a SIM from a different part of the world, you first have to place several minutes of phone calls using a SIM from a carrier in the Americas. This is a completely new, unopened device. You have your choice of gold, black, and white phones, and as usual, shipping is free in the US. This listing won't ship anywhere else, though. Tax will be collected if you live in California or Kentucky.